Disclosure: The Coca-Cola Company provided promotional consideration for my participation in this program. All opinions expressed in the post are my own and not those of The Coca-Cola Company or its parent or affiliates. I’m a firm believer in treating others the way you want to be treated. The quote, “In a world full of people who couldn’t care less, be someone who couldn’t care more” is one that resonates with me and is how I strive to live my life. It brings me joy to do something nice for another person and seeing a smile light up on their face. 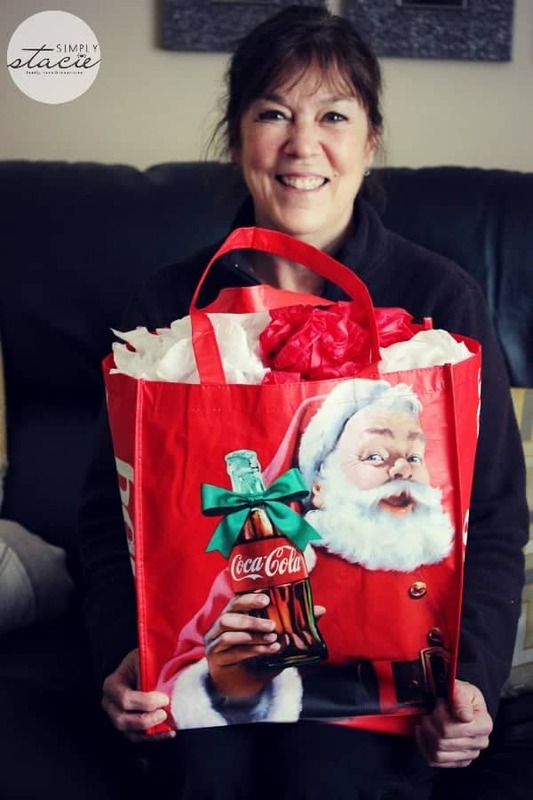 I’m a huge fan of Coca-Cola’s “Make Someone Happy” campaign because it represents how I strive to live my life – being generous, celebrating joy and spreading happiness throughout the holidays and beyond. The true spirit of the holiday season is about togetherness and Coca-Cola is encouraging people all over to open their hearts to spread happiness to people in your life whether it’s someone you just met or a close relative. Generosity isn’t always about giving money to those in need. It can be about giving your time, attention, love or even laughter. These simple, profound gestures can have a lasting effect on another person. It makes the other person feel good inside and it also makes you feel like you’ve done something special. I’ve said this before and I’ll say it again, it feels good to give. “Make Someone Happy” can be done anytime of year so remember this simple motto even after the holiday excitement is over and we are back to the daily grind. Coca-Cola recently debuted a new commercial featuring people creating happiness for others. Watch it for inspiration on how you can “Make Someone Happy” in your life. 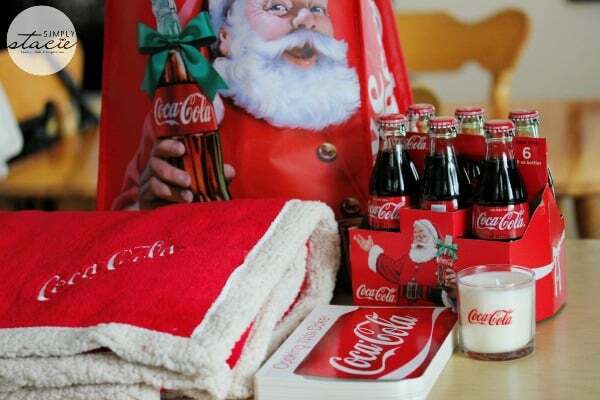 I was on my own mission to spread happiness and had a Coca-Cola holiday gift pack to give to someone special in my life. I decided that person should be my Auntie Lori. You won’t find a nicer person than her. She has an infectious smile and laugh and lights up any room she is in. She’s also a cleaning woman extraordinaire and has helped me numerous time with some projects around my house. My house was in need of some major TLC when I purchased it in June and Auntie Lori was the first to offer to come help me clean it up. I offered to pay her and she wouldn’t accept my money. That’s the kind of person she is – she gives without ever expecting anything in return. I wanted to make her happy and show how thankful I am to have her in my life. 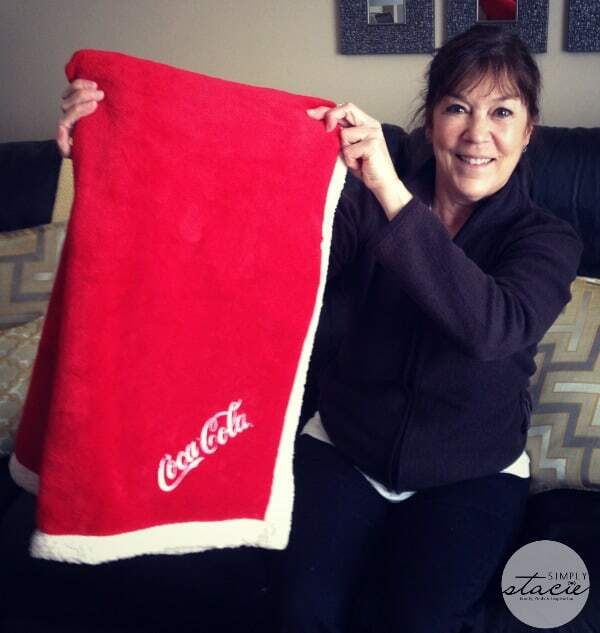 When she came over the other day to my home, I surprised her with the Coca-Cola holiday gift pack. She was not expecting it at all! She opened it up and was telling me how much she loved all the goodies inside. She remarked how the blanket will match her bedroom and is perfect for the cold winter nights. She thanked me and was really genuine in her appreciation for a surprise gift. I’m glad I could help make her day. She deserves it! 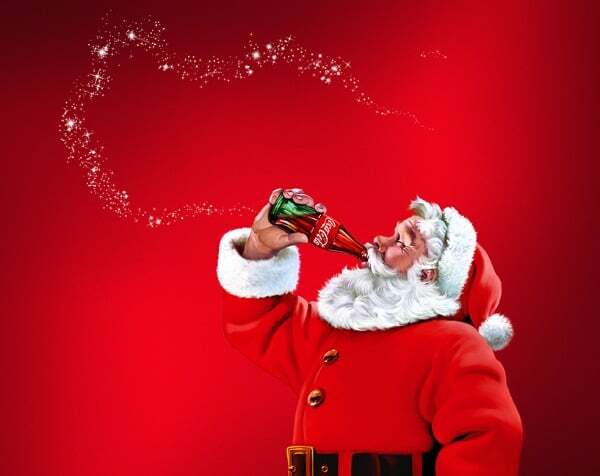 You may have also noticed that Coca-Cola has brought back the classic Santa Claus in its ads this year. 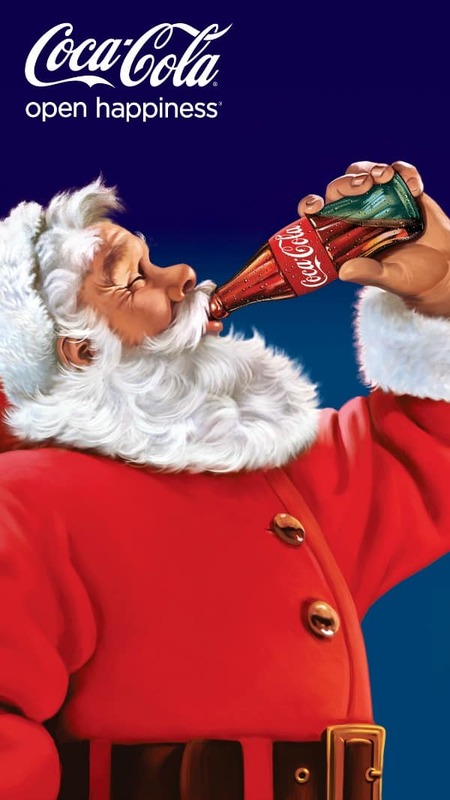 This iconic Haddon Sundblom Santa has been around since 1931 and was created just for Coca-Cola to symbolize true holiday spirit. I thought it was neat they were bringing back a piece of history this holiday season! Look for him on Coca-Cola products. Also, keep an eye out for the Coca-Cola holiday caravan. It features five trucks each lit up with more than 30,000 red and white sparkling lights. 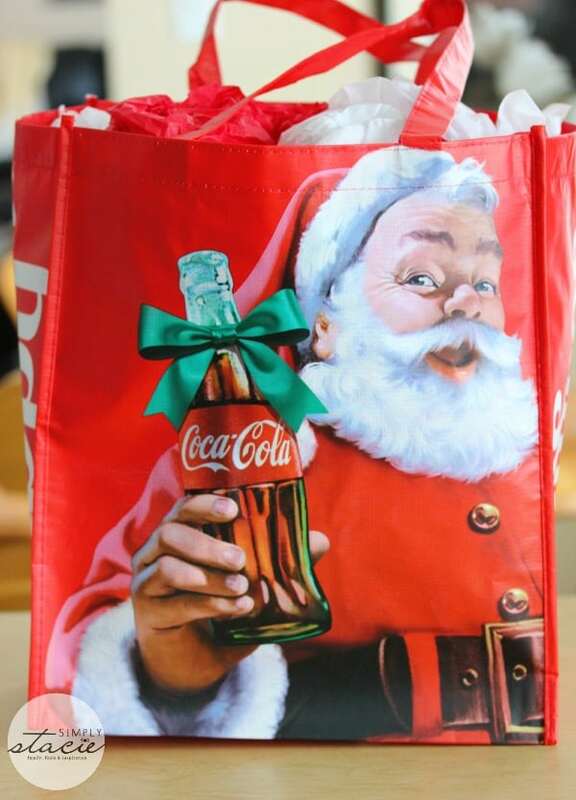 The Coca-Cola holiday caravan will be rolling into cities across the United States to spread happiness through to December 21, 2014. In the hustle and bustle of the next couple weeks, remember it’s the small gestures that can make a big impact. Be kind, generous and celebrate the joy of the holidays. My question for you is simple – how will you make someone happy this holiday season and beyond? Connect with Coca-Cola on Twitter, Facebook and Instagram. We try to make someone happy by donating to our local charities year round, not just during the holiday seasons.